V. 2 has original blind stamped brown calf over wooden boards, rebacked; v. 1 has blind-stamped brown calf made by Sangorski & Sutcliffe to match v. 2 in 1954. Unidentified original owner; his motto (et non autre) on fol. 19, 21, 36v, 53, 61v, 68v, 75, 91v, 330, and 352v; his knotted initials (I and B) on fol. 19, 21, 36v, 53, 61v, 68v, 75, 81, 101, 127, 139, and 149. Vol. 1: Sir Philip Baker-Wilbraham; purchased in Oct. 1936 from Maggs Brothers Ltd., London; deposited in the Pierpont Morgan Library by the Trustees of the William S. Glazier Collection in 1963. Vol. 2: London, Sotheby's, June 14, 1954, lot 34; purchased there for William S. Glazier (1907-1962) by Maggs Brothers Ltd., London; deposited in the Pierpont Morgan Library by the Trustees of the Glazier Collection in 1963. 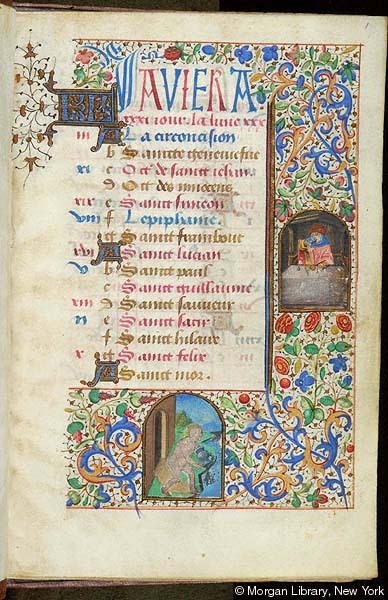 Book of hours for the use of Paris; calendar in French; written and illuminated in the Loire region of France, ca. 1475. Two volumes foliated consecutively: v. 1, folios 1-224; v. 2, folios 225-357. Decoration: 20 miniatures, 64 historiated initials, 24 calendar illustrations, full borders on the miniature pages. Artists: two followers of the Coëtivy Master.